IL-27 has recently been identified as a differentiation factor for the generation of IL-10-producing regulatory type 1 (Tr1) T cells. However, how IL-27 induces the expansion of Tr1 cells has not been elucidated. In this study we demonstrate that IL-27 drives the expansion and differentiation of IL-10-producing murine Tr1 cells by inducing three key elements: the transcription factor c-Maf, the cytokine IL-21, and the costimulatory receptor ICOS. IL-27-driven c-Maf expression transactivates IL-21 production, which acts as an autocrine growth factor for the expansion and/or maintenance of IL-27-induced Tr1 cells. ICOS further promotes IL-27-driven Tr1 cells. Each of those elements is essential, because loss of c-Maf, IL-21-signaling, or ICOS decreases the frequency of IL-27-induced differentiation of IL-10-producing Tr1 cells. Interleukin-27, a member of the IL-12/IL-23 heterodimeric family of cytokines produced by APCs, is composed of two chains, IL-27p28 and EBV-induced gene 3 (1). Activated T cells and NK cells have the highest expression of IL-27R, which is composed of two chains, a specific IL-27Ra chain (WSX-1 or TCCR) and a signaling chain, gp130, that it shares with IL-6R (1). Initial studies have suggested that, similarly as IL-12, IL-27 induces the expansion of proinflammatory Th1 cells by activating the STAT-1-mediated T-bet pathway (1). However, analysis of the IL-27Ra−/− (WSX-1−/−) mice infected with various pathogens resulted in clearance of the parasites with exaggerated T cell responses and enhanced proinflammatory cytokine production (1). Furthermore, IL-27Ra−/− mice developed severe experimental autoimmune encephalomyelitis with enhanced Th17 responses (1), and treatment with rIL-27 suppressed disease and decreased the frequency of Th17 cells (1). These paradoxical observations led to the hypothesis that IL-27 may not be necessary for the generation of proinflammatory T cells (Th1 or Th17), but rather play a crucial role in regulating T cell responses. Subsequently, three groups, including ours, reported that IL-27 not only inhibited the generation of Th17 cells but also induced differentiation of IL-10-producing regulatory T cell type 1 (Tr1)3 from naive T cells (2, 3, 4). Tr1 cells are a subset of T cells that have strong immunosuppressive properties, predominantly produce IL-10 with variable amounts of IFN-γ, but do not express Forkhead box 3 (Foxp3) (5). Adoptive transfer of Tr1 cells has been shown to suppress autoimmunity, colitis, graft-vs-host disease, and tissue inflammation (6). Although initial studies suggested that Tr1 cells are induced by repetitive antigenic stimulation of T cells in the presence of IL-10 (6), T cells differentiated in the presence of IL-10 could not be propagated long term in culture. The identification of IL-27 as a differentiating factor for the generation of Tr1 cells provided a means by which they could be grown in large numbers and facilitated their functional analysis. However, the molecular mechanisms by which IL-27 mediates the generation and/or expansion of Tr1 cells are not well understood. Thus, we analyzed the expression of various key cytokines and transcription factors induced by IL-27. Our results show that IL-27 is a potent inducer of three essential elements: the transcription factor c-Maf, the cytokine IL-21, and the costimulatory receptor ICOS, which coordinately work together to promote differentiation of Tr1 cells. IL-10-enhanced GFP reporter mice (Vert-X), Foxp3.gfp “knock-in” mice, ICOS−/− mice on C57BL/6 background, were generated as described (7, 8). WSX-1−/− mice on C57BL/6 background were obtained from C. Saris (Amgen, Thousand Oaks, CA), and IL-21R-deficient mice on NOD background (9) from N. Sarvetnick (Scripps Research Institute, La Jolla, CA). c-Maf−/− mice on an N5 BALB/c background have been described (10). Mice were housed in conventional, pathogen-free facilities at the Harvard Institute of Medicine (Boston, MA). All experiments were undertaken in accordance with guidelines from the Committee on Animals at Harvard Medical School (Boston, MA). Naive CD4+ T cells (CD4+CD62LhighCD25−), pooled from both spleen and lymph nodes, or memory cells (CD4+CD44+), obtained from lymph nodes, were purified by flow cytometry and stimulated with plate-bound Ab against CD3 (145-2C11; 1 μg ml−1) and CD28 (PV-1; 1 μg ml−1). Cells were cultured as previously described (8). Monoclonal anti-TGF-β1 Ab (10 μg ml−1), mouse IL-21 (80 ng ml−1), mouse IL-27 (25 ng ml−1), and anti-mouse IL-21 Ab (25 μg ml−1) were all purchased from R&D Systems. Proliferation assay was performed as previously described (8). Secreted cytokines were measured after 48 h by cytometric bead array (BD Biosciences) or ELISA. Intracellular cytokine staining was performed by as previously described (8). RNA was extracted with RNeasy mini kits (Qiagen) and analyzed by real-time PCR according to the manufacturer’s instructions (Applied Biosystems). The following primers/probe mixtures were purchased from Applied Biosystems: IL-10 (catalog no. Mm 00439615_g1); ICOS (catalog no Mm004497600_m1); c-Maf (catalog no Mm 02581355_S1); IL-21 (catalog no. Mm00517640_m1); and IL-21R (catalog no. Mm00600319_M1). HEK 293T cells (105) were cotransfected with pGL3-IL-21-Luc reporter plasmid and Renilla luciferase reporter plasmid (pRL-TK) and vector pcDNA3.1, pcDNA3.1(hemagglutinin-c-Maf), pcDNA3.1(T-bet), or pcDNA3.1(human GATA3). Cells were collected 24 h post-transfection and IL-21 promoter activities were analyzed using Dual-Glo luciferase assay system (Promega) according to the manufacturer’s instructions. The luciferase activities were normalized against the Renilla luciferase activity. Thymi from c-Maf−/− fetuses were removed on embryonic day 16.5 and individual lobes were cultured for 7 days. Genotyping was performed using DNA isolated from the fetal limbs. Thymocytes were recovered on day 7 of culture after collagenase digestion. CD4+CD8−CD25− cells were sorted and cultured for 4 days on anti-CD3 (2 μg ml−1)- and anti-CD28 (2 μg ml−1)-coated plates. Statistical analysis was performed using an unpaired Student’s t test. To understand the molecular mechanisms by which IL-27 induces and expands Tr1 cells, we analyzed the expression of genes up-regulated by IL-27 at multiple time points following T cell activation in the presence of IL-27. As expected, IL-27 induced IL-10 mRNA expression that peaked 48 h postactivation (Fig. 1⇓A). Interestingly, IL-27 induced the expression of the transcription factor c-Maf, at early time points, and this expression progressively increased over time (Fig. 1⇓B). Consistent with our previous observation that c-Maf regulates IL-21 expression in Th17 cells (8), we observed that IL-27 also induced IL-21 mRNA and that IL-10 and IL-21 showed similar kinetics of mRNA expression (Fig. 1⇓, A and C). Although IL-21R expression was low in unactivated T and B cells, TCR-driven activation up-regulated this expression and IL-27 further up-regulated IL-21R expression in activated T cells (Fig. 1⇓D). We (8) and others (11) have shown that the c-Maf transcription factor is downstream of ICOS, and because IL-10-producing T cells were first shown to be preferentially costimulated by ICOS (12), we examined the expression of ICOS mRNA and observed that the addition of IL-27 indeed induced higher ICOS expression than T cell activation without IL-27 (Fig. 1⇓E). Thus, IL-27, in addition to inducing IL-10 production, induced c-Maf, IL-21, IL-21R, and ICOS expression. At the protein level, T cells activated in the presence of IL-27 produced both IL-10 and IL-21, thus confirming mRNA expression (Fig. 1⇓, F and G). Besides the mRNA expression, we also observed an increase in ICOS expression induced by IL-27 at the protein level (data not shown). Furthermore, IL-27Ra−/− (WSX-1−/−) mice produced no detectable IL-10 or IL-21 and did not show an increased ICOS expression upon activation, indicating that IL-10 and IL-21 production and increased ICOS expression were specifically induced by IL-27 (Fig. 1⇓, F and G, and data not shown). To analyze the cells that produce both IL-10 and IL-21, we undertook intracellular cytokine staining for IL-10 and IL-21 after 3 days of culture in vitro with IL-27 and found that the IL-10-producing cells also produced IL-21 (Fig. 1⇓H). IL-27 induces c-Maf, IL-21, IL-21R, and ICOS. A–E, RNA isolated from naive CD4+CD62LhighCD25− cells cultured with IL-27 (open squares) or without IL-27 (closed squares) were subjected to real-time PCR relative to the expression (rel. expression) of mRNA encoding β-actin (2−ΔCT × 100,000; where CT is cycle threshold) to examine the expression of cytokines at different time points following activation. Real-time PCR of IL-10 (A), c-Maf (B), IL-21 (C), IL-21R (D), and ICOS (E) induction by IL-27 is shown. F and G, IL-10 and IL-21 production was measured by cytokine bead array as induced by IL-27 in WT (open bars) and IL-27Ra−/− (WSX-1−/−) (filled bars) CD4+CD62LhighCD25− cells. H, Intracellular cytokine staining of IL-10 and IL-21 by T cells following activation in the presence of IL-27. Because IL-21 belongs to the IL-2 cytokine family and uses the common γ-chain receptor, we hypothesized that IL-27-driven IL-21 production from T cells may be an autocrine growth factor for the generation of Tr1 cells. To test this, we first added a neutralizing IL-21 Ab in the presence of IL-27 and found that blocking IL-21 reduced the frequency of IL-10-producing T cells significantly by >75% (Fig. 2⇓A) and IL-10 cytokine production in the culture supernatants by >50% (Fig. 2⇓B). Further addition of IL-21 together with IL-27 increased IL-10 production, but this increase with exogenous IL-21 was modest (Fig. 2⇓B). These data raised the issue of whether IL-21 could directly expand IL-10-producing T cells. However, activation of T cells from mice lacking IL-27Ra (WSX-1) signaling in the presence of IL-21 and IL-27 did not expand Tr1 cells (supplemental Fig. 2). We further confirmed the role of IL-21 in the expansion of Tr1 cells using CD4+ T cells from IL-21R-deficient mice. Loss of IL-21 signaling resulted in the inhibition of IL-27-driven generation of IL-10-producing T cells by >75% (Fig. 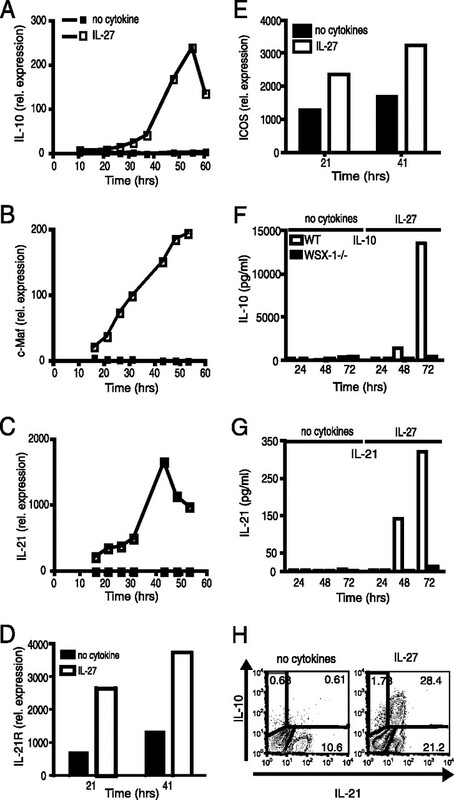 2⇓C) and IL-10 cytokine production in the culture supernatants by over 90% (Fig. 2⇓D). However, loss of IL-21 signaling had no effect on IL-27-driven IFN-γ production (data not shown). Furthermore, IL-21R-deficient CD4+ T cells stimulated with IL-27 expressed lower levels of c-Maf and IL-21, as determined by real-time PCR (Fig. 2⇓E). These data suggest that IL-21 may be an important growth factor induced by IL-27 to expand Tr1 cells without affecting the expansion of IFN-γ-producing cells. Because IL-27 not only induces IL-21 production but also induces IL-21R expression, these data suggest that IL-27-mediated IL-21R up-regulation might be required for IL-21 to expand Tr1 cells. IL-21 is necessary for IL-10 production in Tr1 cells. A, IL-10.GFP expression as analyzed by flow cytometry in naive T cells activated in the presence of IL-27 for 72 h with or without the addition of neutralizing anti-IL-21 (aIL-21) Ab. B, ELISA to detect IL-10 production in the supernatant of naive T cells differentiated with IL-27 and anti-IL-21 or IL-21 (mean and SD; ∗∗∗, p = 0.0003). C, IL-10 and IFN-γ production by WT and IL-21R−/− naive T cells activated in the presence of IL-27 for 72 h as determined by intracellular cytokine staining and analysis by flow cytometry. D, Supernatants from IL-27 differentiated naive T cells from WT and IL-21R−/− mice analyzed by IL-10 cytokine ELISA (mean and SD); ND, Not detected. E, Real-time PCR analysis of c-Maf and IL-21 in WT and IL-21R−/− CD4+ cells stimulated with IL-27; rel. expression, Relative expression. To study the relevance of IL-21 in expanding Tr1 cells in vivo, we examined the frequency of IL-10-producing Tr1 cells generated in vivo in IL-21R−/− mice. We found that the fraction of IL-10-producing CD4+CD44+ memory T cells was significantly reduced in IL-21R−/− mice, which showed only 10% as many IL-10-producing T cells compared with wild-type (WT) mice (Fig. 3⇓A). In contrast, the frequency of IFN-γ producers was similar in WT and IL-21R−/− cells. To further determine whether IL-27 could correct the defect in Tr1 cell development, CD4+CD44+ memory T cells were activated in the presence of IL-27, but IL-21R−/− mice continued to show a significant reduction in IL-10-producing T cells (data not shown). CD4+CD44+ T cells purified from IL-21R−/− mice also showed a lower expression of c-Maf and IL-21 mRNA (Fig. 3⇓B), highlighting the importance of this amplification loop in generating Tr1 cells. In addition to the induction of c-Maf, IL-21, and IL-21R, IL-27 also enhanced the expression of ICOS. Because IL-10-producing T cells were first shown to be preferentially costimulated by ICOS (12), we analyzed the effect of a lack of ICOS signaling on the induction of Tr1 cells by IL-27. In vitro differentiation of T cells from ICOS-deficient mice demonstrated that IL-10 production by ICOS−/− T cells was similar to that by WT T cells at 48 h, but by 72 h there was a significant defect in IL-10 production induced by IL-27, as determined by cytometric bead array (Fig. 3⇓C) and by intracellular staining (data not shown). In the plate-bound Ab system used here, the ICOS ligand (ICOS-L) is most likely provided by the CD4+ T cells, because T cells can express ICOS-L when activated (13). When Tr1 cells were differentiated from ICOS−/− mice, it was clear that ICOS−/− mice had a defect in sustaining growth/expansion of Tr1 cells in vitro. 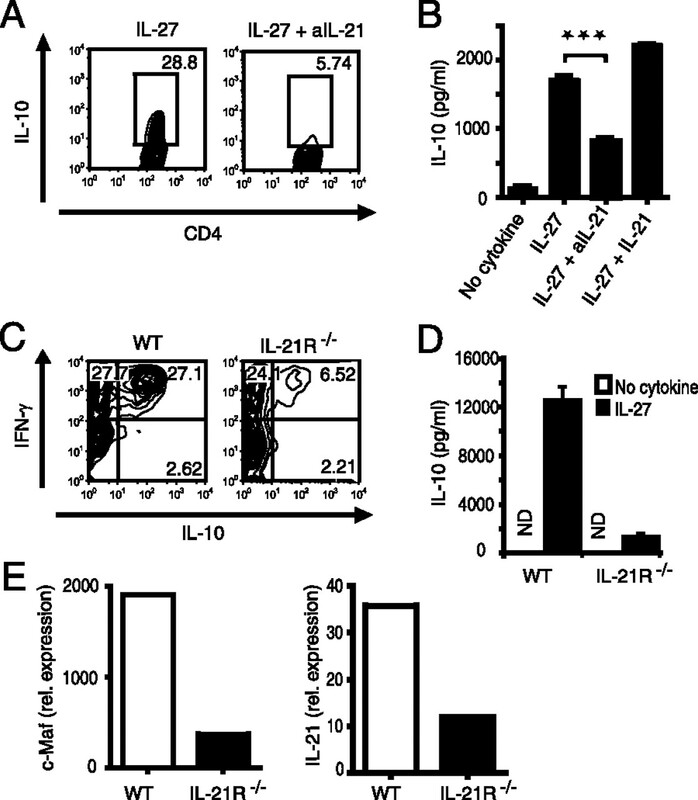 Memory CD4+CD44+ cells from IL-21R−/− mice are defective in IL-10 production in vivo. A, IL-10 and IFN-γ production as detected by intracellular cytokine staining in memory CD4+CD44+ T cells after 72 h of in vitro activation (n = 5 mice per group). IL-21R−/− CD4+CD44+ T cells from lymph nodes are defective in IL-10 production (∗∗, p = 0.0077) but not for IFN-γ as compared with WT controls. B, Real-time PCR analysis of IL-21 and c-Maf in WT and IL-21R−/− CD4+CD44+ T cells cultured in vitro for 48 h; rel. expression, Relative expression. C, IL-10 production induced by IL-27 in WT (filled bars) and ICOS−/− (open bars) CD4+CD62L+ CD25− T cells as measured by cytokine bead array. Our results clearly demonstrated that IL-27 induces expression of c-Maf and that expressions of c-Maf and IL-21 mRNA appeared to be coexpressed in differentiating Tr1 cells under various differentiation conditions (Figs. 1⇑, 2⇑E, and 3⇑B). Therefore, we compared c-Maf expression in T cell subsets (Th0, Th1, Th2, Th17, and Tr1), and observed that Tr1 cells had ∼500-fold higher expression than Th1 or Th2 cells (Fig. 4⇓A). We have observed that c-Maf and IL-21 mRNA were coexpressed by Tr1 cells, suggesting that c-Maf may be a transcription factor for IL-21, which in turn expands Tr1 cells. Our analysis of the IL-21 promoter revealed four putative conserved binding sites located 1070 bp (half MARE), 370 bp (v-MARE), 260 bp (half MARE) and 200 bp (v-MARE) upstream of the transcriptional start site (where MARE is Maf recognition element and v-MARE is v-Maf recognition element). To test this, an IL-21 promoter-luciferase reporter construct was cotransfected with a c-Maf expression plasmid into HEK 293T cells. Interestingly, c-Maf could transactivate IL-21 promoter-luciferase in a dose-dependent manner, but the transcription factors T-bet and GATA3, which are involved in Th1 and Th2 differentiation, could not (Fig. 4⇓B), suggesting that c-Maf may expand Tr1 cells by inducing IL-21 production. Indeed, we have previously shown that c-Maf-deficient mice have a defect in IL-21 production (8). To address whether c-Maf-deficient mice have a defect in the IL-27-mediated IL-10 and IFN-γ production, we activated c-Maf-deficient T cells in the presence of IL-27 and analyzed the expression of IL-10 and IFN-γ. IL-27 was not able to induce either IL-10 or IL-21 production in c-Maf-deficient CD4+ T cells (Fig. 4⇓C and data not shown), but the IL-27-mediated IFN-γ response was not affected (data not shown). As c-Maf has been described to directly transactivate the IL-10 promoter (14, 15), we further added IL-21 to IL-27-activated c-Maf-deficient CD4+ T cells and showed that exogenous IL-21 can partially rescue IL-10 production in c-Maf−/− T cells (Fig. 4⇓D), highlighting the importance of IL-21 transactivation by c-Maf. IL-27 induces c-Maf, which transactivates IL-21. A, Relative expression (rel. expression) of c-Maf in Th0, Th1, Th2, and Th17 cells as detected by real-time PCR. B, c-Maf transactivates the IL-21 promoter in HEK293 T cells as detected by cotransfection of the IL-21-luciferase reporter plasmid (IL-21Luc reporter) with c-Maf expression vector (c-Maf) transfected at three different plasmid concentrations (100, 300 or 900 ng), the control empty expression vector (vector; 900 ng), the T-bet vector (900 ng), or the GATA3 (900 ng) vector. Promoter activity was quantified by a luciferase assay 24 h post-transfection. The promoter-luciferase activity observed by transfection of the empty expression vector was normalized to 1. C and D, IL-10 production induced by IL-27 (C) or IL-27 plus IL-21 (D) in WT and c-Maf−/− CD4+CD8−CD25− T cells after 4 days in culture, as detected by cytokine bead array. ND, Not detectable; KO, knockout. These data clearly show that IL-27 induces c-Maf, a transcription factor previously identified in Th2 cells, to transactivate IL-21, which then drives the expansion of Tr1 cells. Therefore, similar to Th17 and T follicular helper (TFh) cells, Tr1 cells express c-Maf and IL-21 and use IL-21 for autocrine growth and expansion. It is interesting to note that three different T cell subsets, Tr1, Th17, and TFh cells, which express c-Maf and IL-21, also produce IL-10, albeit at different levels (8, 16, 17). IL-21 acts as an autocrine growth/differentiation factor for all three subsets of T cells. It stands to reason that IL-21, which belongs to the family of IL-2 growth factors and uses the common γ-chain for signaling, may act as an expansion/growth factor for cells that do not produce IL-2. Consistent with this idea, loss of IL-21 or IL-21 signaling results in a defect in all the three T cell subsets, Th17, TFh, and Tr1 (8, 16). Our data are consistent with a recent study showing that IL-21 mediates its inhibitory effects by inducing IL-10 production (18). Similar to IL-6, which induces IL-21 by inducing phospho-STAT-3, IL-27 also induces phospho-STAT-3 and IL-21, most likely due to the fact that IL-6 and IL-27 both share the gp130 chain for signaling. IL-27-enhanced expression of ICOS is of interest because ICOS was initially shown to costimulate IL-10-producing T cells (12). We and others have shown that ICOS/ICOS ligand interaction induces c-Maf expression (8, 11) which may further enhance stable IL-21 production from developing Tr1 cells. Like Th17 and TFh cells, ICOS appears to be crucial in maintaining IL-27-driven Tr1 cells. These results are supported by the observation that ICOS−/− mice indeed have a defect in IL-10-producing T cells and therefore develop more severe autoimmunity (8, 19). IL-27 also up-regulates ICOS for maintenance and survival of Tr1 cells. In summary, we have demonstrated that IL-27 drives the expansion and differentiation of Tr1 cells by inducing expression of three key elements: the transcription factor c-Maf, the growth factor IL-21, and the costimulatory receptor ICOS, which coordinately act to mediate Tr1 differentiation (supplemental Fig. 3). Loss of any of these factors results in a defective IL-27-driven, IL-10-producing Tr1 cells. We thank D. Kozoriz and R. Chandwaskar for cell sorting and technical assistance. ↵1 This work was supported by a grant from the Swiss National Science Foundation (to C.P. ), National Multiple Sclerosis Society Grant RG2571 (to V.K.K. and A.A.), National Institutes of Health (NIH) Grants R01 NS045937, R01 NS035685, R37 NS030843, R01 AI044880, P01 AI039671, and P01 NS038037 (to V.K.K.) and NIH Grant R37A138310 (to A.H.S.). V.K.K. is a recipient of the Javits Neuroscience Investigator Award from the NIH. ↵3 Abbreviations used in this paper: Tr1, regulatory T cell type 1; Foxp3, Forkhead box P3; TFh, T follicular helper cell; WT, wild type. Stumhofer, J. S., C. A. Hunter. 2008. Advances in understanding the anti-inflammatory properties of IL-27. Immunol. Lett. 117: 123-130. Awasthi, A., Y. Carrier, J. P. Peron, E. Bettelli, M. Kamanaka, R. A. Flavell, V. K. Kuchroo, M. Oukka, H. L. Weiner. 2007. A dominant function for interleukin 27 in generating interleukin 10-producing anti-inflammatory T cells. Nat. Immunol. 8: 1380-1389. Stumhofer, J. S., J. S. Silver, A. Laurence, P. M. Porrett, T. H. Harris, L. A. Turka, M. Ernst, C. J. Saris, J. J. O'Shea, C. A. Hunter. 2007. Interleukins 27 and 6 induce STAT3-mediated T cell production of interleukin 10. Nat. Immunol 8: 1363-1371. Fitzgerald, D. C., G. X. Zhang, M. El-Behi, Z. Fonseca-Kelly, H. Li, S. Yu, C. J. Saris, B. Gran, B. Ciric, A. Rostami. 2007. Suppression of autoimmune inflammation of the central nervous system by interleukin 10 secreted by interleukin 27-stimulated T cells. Nat. Immunol. 8: 1372-1379. Vieira, P. L., J. R. Christensen, S. Minaee, E. J. O'Neill, F. J. Barrat, A. Boonstra, T. Barthlott, B. Stockinger, D. C. Wraith, A. O'Garra. 2004. IL-10-secreting regulatory T cells do not express Foxp3 but have comparable regulatory function to naturally occurring CD4+CD25+ regulatory T cells. J. Immunol. 172: 5986-5993. Roncarolo, M. G., S. Gregori, M. Battaglia, R. Bacchetta, K. Fleischhauer, M. K. Levings. 2006. Interleukin-10-secreting type 1 regulatory T cells in rodents and humans. Immunol. Rev. 212: 28-50. Sun, J., R. Madan, C. L. Karp, T. J. Braciale. 2009. Effector T cells control lung inflammation during acute influenza virus infection by producing IL-10. Nat. Med. 15: 277-284. Bauquet, A. T., H. Jin, A. M. Paterson, M. Mitsdoerffer, I. C. Ho, A. H. Sharpe, V. K. Kuchroo. 2009. The costimulatory molecule ICOS regulates the expression of c-Maf and IL-21 in the development of follicular T helper cells and TH-17 cells. Nat. Immunol. 10: 167-175. Kim, J. I., I. C. Ho, M. J. Grusby, L. H. Glimcher. 1999. The transcription factor c-Maf controls the production of interleukin-4 but not other Th2 cytokines. Immunity 10: 745-751. Nurieva, R. I., J. Duong, H. Kishikawa, U. Dianzani, J. M. Rojo, I. Ho, R. A. Flavell, C. Dong. 2003. Transcriptional regulation of Th2 differentiation by inducible costimulator. Immunity 18: 801-811. Hutloff, A., A. M. Dittrich, K. C. Beier, B. Eljaschewitsch, R. Kraft, I. Anagnostopoulos, R. A. Kroczek. 1999. ICOS is an inducible T-cell co-stimulator structurally and functionally related to CD28. Nature 397: 263-266. Ling, V., P. W. Wu, H. F. Finnerty, K. M. Bean, V. Spaulding, L. A. Fouser, J. P. Leonard, S. E. Hunter, R. Zollner, J. L. Thomas, et al 2000. Cutting edge: identification of GL50, a novel B7-like protein that functionally binds to ICOS receptor. J. Immunol. 164: 1653-1657. Cao, S., J. Liu, L. Song, X. Ma. 2005. The protooncogene c-Maf is an essential transcription factor for IL-10 gene expression in macrophages. J. Immunol. 174: 3484-3492. Xu, J., Y. Yang, G. Qiu, G. Lal, Z. Wu, D. E. Levy, J. C. Ochando, J. S. Bromberg, Y. Ding. 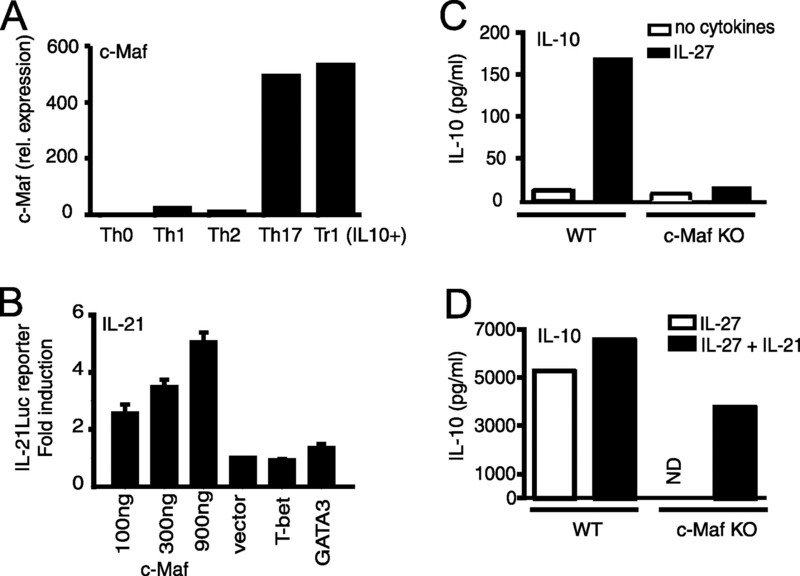 2009. c-Maf regulates IL-10 expression during Th17 polarization. J. Immunol. 182: 6226-6236. Nurieva, R., X. O. Yang, G. Martinez, Y. Zhang, A. D. Panopoulos, L. Ma, K. Schluns, Q. Tian, S. S. Watowich, A. M. Jetten, C. Dong. 2007. Essential autocrine regulation by IL-21 in the generation of inflammatory T cells. Nature 448: 480-483. Zhou, L., I. I. Ivanov, R. Spolski, R. Min, K. Shenderov, T. Egawa, D. E. Levy, W. J. Leonard, D. R. Littman. 2007. IL-6 programs TH-17 cell differentiation by promoting sequential engagement of the IL-21 and IL-23 pathways. Nat. Immunol. 8: 967-974. Spolski, R., H. P. Kim, W. Zhu, D. E. Levy, W. J. Leonard. 2009. 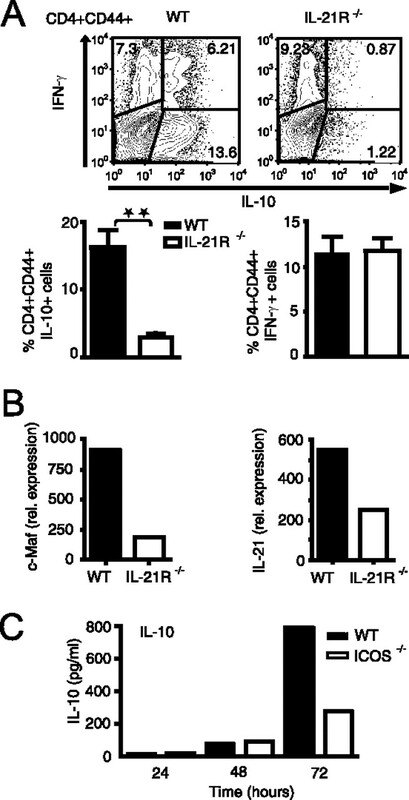 IL-21 mediates suppressive effects via its induction of IL-10. J. Immunol. 182: 2859-2867. Dong, C., A. E. Juedes, U. A. Temann, S. Shresta, J. P. Allison, N. H. Ruddle, R. A. Flavell. 2001. ICOS co-stimulatory receptor is essential for T-cell activation and function. Nature 409: 97-101.